In our first couple of sessions, we covered the general debating principles as they are taught by IDEA – what is debating, how it can help you in every walk of life, what are the key ingredients and how to structure an argument. The exercises from IDEA helped a lot in introducing these – by 3pm the students are not able to absorb lots of theory, they are much more responsive to activities. Two teachers from the school also sit in and gave us feedback to get the students interacting with each other as soon as possible, for example with small group brainstorms, to keep the energy up throughout the session. After we covered the basics, we decided it was important to give the students a taste of debating as soon as possible. We’ve picked a different motion each week and got the students to debate - at first with less structure and only with volunteer speakers. But recently we started full debates after 15-20 minutes of preparation (we only have one hour in the enrichment period so time is tight). Our other idea was to hone in on one position of the WDC format per session and the roles they have to fulfil; we did one week on 1st prop, one week on 1st op, and a week on 2nd positions – we are finishing with the summary speakers this Wednesday. Preparing a couple of slides in advance with the theory we want to cover, so it is visible throughout the session. The room we are in has a projector which is handy, but printouts / notes would work as well. Getting the students to sit around the table in their speaking positions, and chairing the session formally – including making them stand up to deliver their speeches and banging the table for time. It sounds really small, but it does instil a sense of occasion! Keep raising expectations. Two weeks ago, we started challenging the students to reach 3 minute speeches. In the last session, all the speeches were between 2-3 minutes, so really looking forward to seeing where they will be in another couple of weeks! Agreeing a motion for next week at the end of each session – the 100 top debates on the IDEA website are brilliant because they are meaty subjects – plus the students can prepare by looking at the possible arguments online. It’s also been interesting to see that students struggled most with adding rebuttal to their speeches, and aligning their arguments with the rest of their side, either in the prop or op side. We have more ideas about where to take the club, for example we were planning to show the students speeches from high profile school competition and then get them to prepare and debate the same motion. 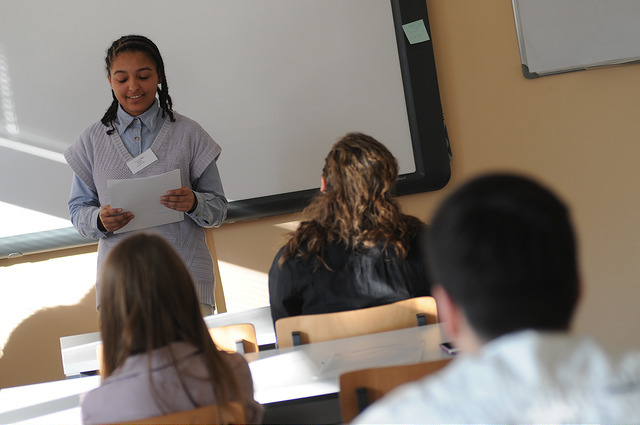 We are excited to see them keep growing their skills – and hopefully start competitive debating next year!